Kick off your visit on the 22nd (Wed): take in the spiritual surroundings of Digamber Jain Temple and then take in the spiritual surroundings of Golden Temple - Sri Harmandir Sahib. To find other places to visit, more things to do, where to stay, and more tourist information, refer to the Amritsar trip planner . Thiruvananthapuram (Trivandrum) to Amritsar is an approximately 6-hour flight. You can also drive; or take a bus. When traveling from Thiruvananthapuram (Trivandrum) in May, plan for a bit warmer days and little chillier nights in Amritsar: temperatures range from 46°C by day to 26°C at night. 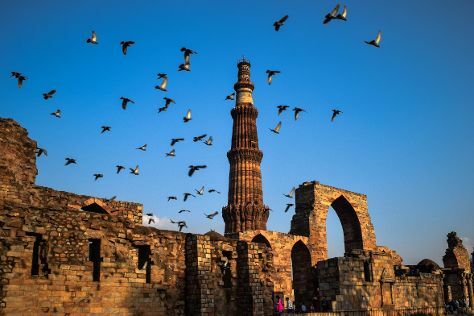 Cap off your sightseeing on the 23rd (Thu) early enough to travel to New Delhi. On the 24th (Fri), admire the natural beauty at Akshardham, then take in nature's colorful creations at Humayun's Tomb, and then don't miss a visit to India Gate. On the 25th (Sat), you'll have a packed day of sightseeing: enjoy breathtaking views from Qutub Minar, then contemplate in the serene atmosphere at Lotus Temple, and then steep yourself in history at Gurudwara Bangla Sahib. For maps, photos, more things to do, and tourist information, read our New Delhi day trip planner. You can fly from Amritsar to New Delhi in 3 hours. Other options are to drive; or take a train. Traveling from Amritsar in May, you can expect nighttime temperatures to be somewhat warmer in New Delhi, with lows of 30°C. Finish up your sightseeing early on the 25th (Sat) so you can travel to Jaipur. Kick off your visit on the 26th (Sun): look and learn at Jantar Mantar - Jaipur, get engrossed in the history at City Palace of Jaipur, then stop by K.L. Jewellers, and finally take in the local highlights with Walking tours. Here are some ideas for day two: step into the grandiose world of Amber Palace, then admire the landmark architecture of Jal Mahal, and then make a trip to Hawa Mahal - Palace of Wind. To see reviews, other places to visit, ratings, and other tourist information, you can read our Jaipur road trip tool . Traveling by flight from New Delhi to Jaipur takes 2.5 hours. Alternatively, you can drive; or take a bus. May in Jaipur sees daily highs of 48°C and lows of 32°C at night. Wrap up your sightseeing on the 27th (Mon) early enough to travel back home.